Austerlitz, the German name of the town now called Slavkov u Brna in the South Moravian Region of the Czech Republic (coordinates: 49° 9′ 11″ N, 16° 52′ 35″ E), was a congregation of the Moravian Anabaptists, founded in the spring of 1528 by about 200 members of the nonresistant branch of the congregation at Nikolsburg. Their first preachers were Jakob Wideman and Philip Weber, who did not share the views of the preachers of the Lord of Liechtenstein in the Nikolsburg disputation of 1527, which agreed to the use of the sword and the payment of war-levies, and therefore parted from the other Anabaptists in Nikolsburg. They were given the epithets Kleinhäufler and Stäbler by Hans Spitelmair, the leading preacher of the lord of Liechtenstein, whereupon they called the Liechtenstein branch Schwertler. Before the nonresistant minority left, they sold their possessions as well as they could under the circumstances. When they were assembled outside the city for the departure, they spread out a coat, and "everyone willingly laid his fortune down without compulsion or urging for the support of the needy." At the same time deacons (Brüder der Notdurft) were ordained. The Lord of Liechtenstein pursued them with his knights and urged them to return and be reconciled, but in vain. Reublin reported the division to Pilgram Marpeck in Alsace on 25 January 1531. The lords of Austerlitz, the four brothers Johann, Wenzel, Peter and Ulrich von Kaunitz, permitted the nonresistant group from Nikolsburg to settle on the Haffenmarkt. Austerlitz was soon to become for several years the center of the Anabaptist movement in Moravia, and even for that in Austria and South Germany. The news of the attitude of the members and of the protection granted by landowners spread rapidly wherever Anabaptists lived and were persecuted. Large numbers of them came in from Tyrol, Austria, Styria, Bohemia, Silesia, Bavaria, Swabia, Switzerland and the Palatinate. Many who were soon to become leaders in the Moravian brotherhood were among them, such as Hans Amon, Leonhard Lanzenstiel, also called Seller, and Jakob Hutter in 1529. From Switzerland Wilhelm Reublin (Röubli) had come, who complained that in the absence of Wideman the church was not properly taught and disciplined. The Tyrolese, who had recently arrived under the leadership of Jörg Zaunring, a former assistant priest in Rattenberg, sided with Reublin, adding that the preaching was not as comforting as in Tyrol, and making complaints about the training of children, the marriage of the sisters, etc. Upon his return Wideman presented the matter to the congregation, which now had to choose between him and Reublin. The Tyrolese had to yield (8 January 1531) and, led by Zaunring, they migrated to Auspitz, where they established a new church alongside of the one already there, under the leadership of Philip Weber. The members remaining in Austerlitz were banished four years later. Some of them went to Slovakia, others toward Krasnikov in Lodomeria, and only a few stayed in Moravia; these were at Bucovic where the Tyrolese Ulrich Stadler became their leader. Their former preacher, Jakob Wideman, suffered a martyr's death "for the sake of baptism" with five other brethren in Vienna in 1536. Stadler and his group, as well as the Slovakians, united with the Hutterian Brethren in 1537. In that year they began to resettle in Austerlitz, and in 1538 erected a household on the Hafnermarkt. They found toleration here for 85 years. In 1589 there were six households in the domain. But in October 1622, on the basis of an imperial letter of 28 September 1622, they were banished with the loss of all their property. They found a new home in Hungary and Transylvania. Archiv für Reformationsgeschichte (1933): 197 f. and 182 ff. Beck, Josef. Die Geschichts-Bücher der Wiedertäufer in Oesterreich Ungarn. Vienna, 1883; reprinted Nieuwkoop: De Graaf, 1967. Hege, Christian and Christian Neff. Mennonitisches Lexikon, 4 vols. Frankfurt & Weierhof: Hege; Karlsruhe: Schneider, 1913-1967: v. I, 100. Horsch, John. The Hutterian Brethren: 1528-1931. Scottdale, PA: Mennonite Publishing House, 1931: 38. Jörg, J. B. Deutschland in der Revolutionsperiode von 1522-26. Freiburg, 1851: 680 f.
Hege, Christian. "Austerlitz (Jihomoravský kraj, Czech Republic)." Global Anabaptist Mennonite Encyclopedia Online. 1953. Web. 23 Apr 2019. http://gameo.org/index.php?title=Austerlitz_(Jihomoravsk%C3%BD_kraj,_Czech_Republic)&oldid=144755. Hege, Christian. (1953). Austerlitz (Jihomoravský kraj, Czech Republic). Global Anabaptist Mennonite Encyclopedia Online. 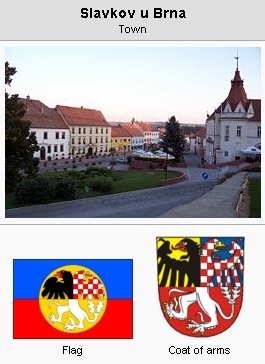 Retrieved 23 April 2019, from http://gameo.org/index.php?title=Austerlitz_(Jihomoravsk%C3%BD_kraj,_Czech_Republic)&oldid=144755. Adapted by permission of Herald Press, Harrisonburg, Virginia, from Mennonite Encyclopedia, Vol. 1, pp. 192-193. All rights reserved. This page was last modified on 16 January 2017, at 00:00.